Sergeant Eddie Forrest is happy that Henry County, Tenn., is home to an Air Evac Lifeteam medical helicopter. Forrest, who works for the Henry County Sheriff’s Department, was transported by the Martin, Tenn., Air Evac crew nearly a few years ago. He is no stranger to heart disease – several years ago Forrest underwent surgery to place stents in his heart. “As far as I knew, I was good,” he said. But on April 15, 2014, his heart demanded more attention. Sheriff Monte Belew and his team secured the Henry County High School auxiliary gym to prepare for a charity game against the Paris Police Department. Several of the deputies jumped into action. Sgt. Bruce Alexander grabbed the Automated External Defibrillator (AED), and Investigator Adam Jenkins and Belew removed the device and prepared to shock their friend and co-worker. 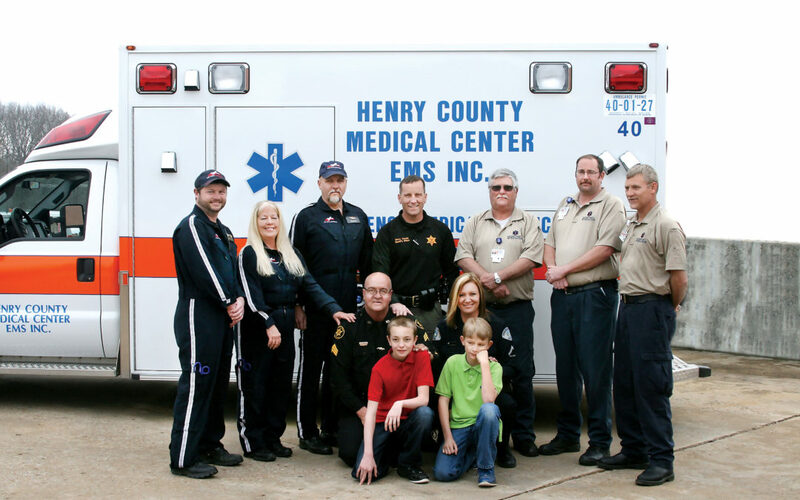 The Henry County Medical Center EMS arrived at the high school and took Forrest to Henry County Medical Center. “The helicopter was already there, waiting on me,” Forrest said. The Martin Air Evac Lifeteam crew of pilot Stephen Clayton, flight nurse Reba Montgomery and flight paramedic Chad Moore flew Forrest to Saint Thomas Hospital in Nashville, where he underwent two surgeries and received a total of six more stents. Forrest has been in law enforcement for 23 years, and his wife, Amanda, works for the Paris Police Department. The worst part of the whole experience, he said, was knowing that his sons witnessed their father’s collapse. Flight nurse Reba Montgomery called Amanda to let her know Eddie was at Saint Thomas Hospital. Amanda is certain that had everything not fallen into place that night, her husband would not be here. Twila Rose, director of Henry County Medical Center EMS, said the chain of survival worked on April 15, 2014. Early activation of the Air Evac crew can and does save lives. The crew is called, and if a medical helicopter is not needed, they return to base. Dr. Mark Stankewicz is a Cardiologist and Medical Director of the Saint Thomas Chest Pain Network. “By advocating system-wide best practices and creating strong partnerships between air medical transport providers, local EMS and emergency physicians, critical care nurses and cardiologists, more lives are being saved due to significantly shortened time to treatment. ” Stankewicz said.